General Douglas M. Fraser, former commander in chief of the U.S. Southern Command, will speak Wednesday, Nov. 19, at Duke University. The discussion, “Continuing Security Challenges in Central and South America and the Caribbean: Drugs, Immigration, Disaster Relief and More,” is at 5:30 pm in the Sanford School of Public Policy, Room 04. The event is free and open to the public. 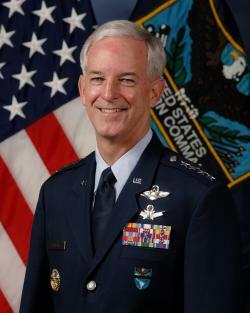 Fraser served from 2009 to 2013 as the commander in chief of U.S. Southern Command (SOUTHCOM), one of nine unified Combatant Commands in the Department of Defense. Its area of responsibility encompasses Central America, South America, and the Caribbean. SOUTHCOM is a joint command comprised of more than 1,200 military and civilian personnel representing the Army, Navy, Air Force, Marine Corps, Coast Guard and other federal agencies. Patrick Duddy, director of Duke’s Center for Latin America and Caribbean Studies, said Fraser brings a valuable perspective on the economic, security, and social changes that the regions have undergone in the last decade. “The United States’ relationship with Latin America and the Caribbean and the other nations of the Western Hemisphere is more important than it has ever been,” said Duddy, a former U.S. ambassador to Venezuela. “Gen. Fraser commanded SOUTHCOM as it responded to one of the most challenging natural disasters in recent human history, the Haitian earthquake. He brings unique insights into managing the U.S.’s security agenda in this region during a period of significant resource constraints.” Fraser is a 1975 graduate of the U.S. Air Force Academy and a native of Colorado. He has commanded operational units across the U.S. Air Force, including the 12th Fighter Squadron at Kadena Air Base, Japan, the 366th Operations Group at Mountain Home Air Force Base, Idaho, and the 3rd Wing at Elmendorf Air Force Base, Alaska. Duke’s Center for Latin American and Caribbean Studies will host the talk, which is co-sponsored by the American Grand Strategy Program. Parking is available in the Sanford lot off Science Drive, from 4:45-7:15 p.m.
View the original Duke Today article here. Price and Perils of Elections in Fragile Democracies: Do They Affect the Political Stability and Development of Nations?